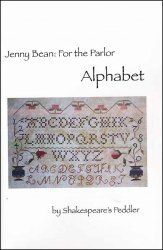 Jenny Bean: For the Parlor Alphabet [G1510] - $8.00 : Yarn Tree, Your wholesale source for cross stitch supplies. Cross stitch pattern by Shakespeare's Peddler. In the middle of this design, the alphabet is stitched in a couple of different fonts. A pot of blooming flowers is stitched on each side of the alphabet. Stitch count for this part is 170 x 100. Stitch count for the entire sampler is 810 x 170.